Hostess cupcakes and all Hostess products were banned from our house because as I’ve mentioned before, my dad thought he was some sort of half-rabbi and didn’t allow brands that weren’t kosher to be consumed. This didn’t make a lot of sense because we didn’t go “all the way” and have separate sets of dishes and get our meat from kosher butchers and so on. 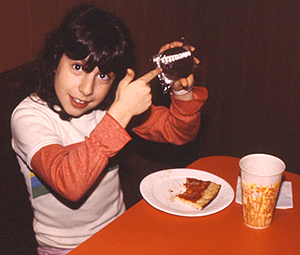 Anyway, one of the few times we were allowed such treats, other than the non-kosher wonderlands of eating at friends’ houses, were birthday parties at Roller Rink in Ashland, MA. Besides having an awesome time skating in circles and trying not to be the cause of a pile-up on the rink floor, when it was “birthday time” the DJ would announce your birthday and tell you and your friends to go in the party room where there were plates with pi zza and a Hostess cupcake. My sister and I seriously were excited to be allowed to eat what “normal” kids ate all the time. So that’s my history with Hostess Cupcakes. I want to say Little Debbie didn’t have a cupcake at the time because my sister and I were so familiar with her products that we would have got those, but I could be wrong. By the way, the last time I ate one of these was probably in the above photo but I expected total awesomeness. Instead, Ethan and I both found these to be a little dry in the cake area and had a very mild chocolate flavor. In fact they really didn’t taste like anything. The frosting seemed a kind of waxy and bland and the cream middle had just a hint of vanilla. Ethan noted there was also a chemical after taste. I really like the mimic of the icing loops on the top of the cupcake. It’s enough to associate with Hostess but then the hextagonal form of the cupcake says “I’m my own thing!”. And they were in the way that they actually tasted like chocolate and the cake was moist. We agreed the cream inside was more enjoyable, as it wasn’t as gritty as Hostess. Also the outer coating wasn’t as waxy and tasteless too. Little D does it again but only because Hostess was lacking so much flavor. Neither of these were what I remembered craving so much as a kid and since Ethan wasn’t impressed either, I wonder if there has been a change in recipe for Hostess. Little Debbie seems to have a better formula but still her Swiss Rolls are something I feel are perfected and not so much with her cupcakes. Cupcakes: Hostess or Lil' Deb? We don’t have this particular brand in oz, but i have seen some things that are similar, we also have a strawberry version. It’s those loops of icing that i am familiar with that makes me go ‘i know what that is’! I prefer the strawberry version because i’ve never been a big fan of chocolate cake or chocolate flavour. 🙂 Makes me want to go out and buy some now! Hostess Orange Cupcakes are a thousand times more excellent than either of these. Wow I’m surprised. It’s been ages since I’ve had a Hostess Cupcake yet always thought that if I’d return to the sweet treat of childhood it would be the same. Your review has me doubting this. To be honest I’ve never actually made the foray into Little Debbie baked good line. She just wasn’t a product I grew up on. Come to think of it, the only product that comes to mind I’ve had from her little palms are the Christmas Cake snacks that are currently on shelves for the holiday season. I’ve been craving a Hostess cupcake over the last few months, but maybe I’ll give Deb a shot and avoid disappointment. Thanks for the heads up! Regarding the orange version mentioned by Jake. I recently had that around Halloween. They may be “a thousand times more excellent” only to someone who finds orange and cake appealing. I don’t believe I had that combo before this past Halloween, and I can say with assurance, I am not part of that dessert camp. Hostess chocolate cupcakes are dry and awful. I do enjoy their orange cream cupcakes though. Michael Kaye, thanks for reminding me about those Christmas Cakes from Little Debbie. I forgot how much I enjoyed those and will have to run out and get some. Too bad there’s nothing to compare them to. 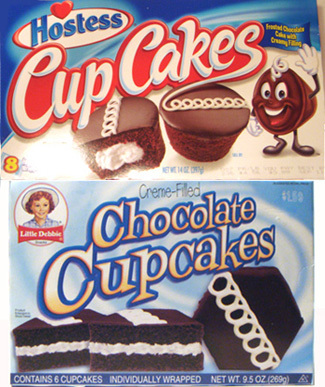 I find Hostess cup cakes to be far superior. I agree with the last comment; I have always found LD cakes to be dry. Maybe it is just because I grew up on Hostess and as I am often reminded I never really grew up past 7 so I never gave the delicious cake up for more than a couple months. However, I recently moved to NYC for a job and the fact that the Hostess brand is scarce out here has led me into Entenmann’s snack cakes which I also feel are superior to Little Debbie. And hey, all Little Debbies are certified kosher. Everybody wins! Glad to hear you preferred the Little Debbie cupcakes, and thanks for sharing your story! Mrs. Freshley makes better chocolate cupcakes than either Little Debbie or Hostess, in my opinion. They have rich chocolate flavor and are very moist. Growing up a hop, skip and a jump from the Little Debbie plant, we always thought of Hostess as the off brand. And I’ve got to say, as I’ve grown older, the products have borne that theory out. Hostess stuff is always overly gooey for my taste, and the flavors taste kind of fake to me. 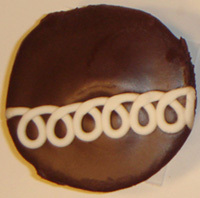 You should compare the Little Debbie Cupcakes with Hostess Ding Dongs. They seem to be more similar. 5yj5hn, How do you know that everyone’s fat? Can you prove that everyone here has no control over their diet? Just because people occasionally have a treat & a preference for a treat doesn’t mean that they’re fat. Saw the post,and thought it was cool. 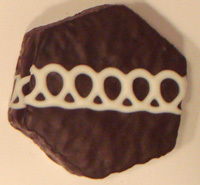 I’m doing something kind of along the same lines at snackbracket.com take a look. It’s a 32 field snack cake tournament, including regions, seedings, etc. We will also have multiple versions of the same cake, such as the Ding Dong vs. the Ring Ding and Swiss Rolls vs Yodels vs Ho Ho. Oh, and the best part is that people will be able to fill in and submit their own bracket online. Winner takes home the full field of 32. Little Debbie will be launching a totally new Cupcake on Sept 1st Nationwide. It will have the look of a pan baked Hostess Cupcake but that’s were the simularity stops. The cake is moist with the best chocolate flavor. The creme and icing all won on the blind taste tests. This Cupcake is the one you have been waiting for. There will be online coupons at Littledebbie.com in the coming weeks. There is also a TV commercails with the new Smart cars that look like a Cupcake that will also be given away and you can register online. I can’t find Little debbie cupcakes anywhere in the past month or two. Is it because they are changing it like Rick says? You might want to rethink the Little Debbie Cupcake survey. Little Debbie’s new cupcake is to die for. They blow Hostess out of the way and make a totally better cupcake than ever before. Well I have just a Little Debbie Cup Cake, and to be honest I think taste like the plastic wrapper it came in. It looks good, mosit even smells good. I think it might have been good before it got wraped but it is just tainted and taste like plastic. I think the new cupcakes are really bad. The original cupcake was really good. I used to buy anywhere from 3-4 boxes a week. But now I will not buy them due to tasting bad as well as the new price increase, which I would be willing to pay the new price for the old ones, but not the new really bad tasing ones. I think they will see there bottom line change very quickly and hopefully bring back the original ones. Good luck Little Debbies I think you will need it with the new version. The new one is better than Hostess, but not nearly as good as the old ones. Why do companies keep screwing up a good thing. There was already a product like this on the market (Hostess). LD’s was unique. My kid loved the old ones and won’t eat the new ones. And what’s with the crazy new price? Well i am doing a speech in my public speaking class on the difference of little debbies to Hostess and what i have gathered from you all (by the way thanks to all of you) is that basically Hostess is better than the new little debbies but the old little debbies were way better than any Hostess cupcake and little debbies taste like wax and plastic and the chocolate is nasty right so what is so wrong with Hostess then. May i ask. I am doing this for a college course class and i need some feed back i too love Hostess and would never perfer any other brand no matter what comes along ive never tasted little debbies anything but her swiss rolls i will kill for! little debbie’s is great! They are more than good they’re greeeaattttt! Hostess is way too expensive!! You can buy the same exact thing in Little Debbie for maybe 1/3 of the price, therefore Little Debbie gets my vote. Oh, and they taste just as good too!! I have to say snack for snack, Little Debbie is the queen. Hostess cupcakes, zingers, and Twinkies all have a je ne sais quois that I find disappointing every time….a firmness and an acidity perhaps that make the snack taste not fresh, but slightly embalmed? Little Debbie’s always tastes fresh. In fact I just went to the store for some Zebra cakes (my favorite) and all that they had were Hostess products. So I came home with a pack of Hostess Frosted Yellow Cupcakes and I am again disappointed. Nowhere near as good as any of the Little Debbie cupcakes or snack cakes. Awesome site! I’m writing a blog post about a low-carb version of these cakes but couldn’t figure out if I was making the Hostess or the Little Debbie kind, and your picture did all the work for me. And then I saw that your latest review is of my very favourite not-at-all-cheese cheese product from The Laughing Cow. BFFs! Original yodel cakes were much better. Looks like hostess bought the brand and changed the recipe. It’s not the same. Loved to have tasted the original in dark chocolate. I am Muslim and we have basically the same dietary restrictions as our Jewish brothers and sisters. We call our meat Halal rather than Kosher. I think Hostess tastes a 1000 times better but can only eat the Hoho’s, muffins, and fat free since they don’t use animal products. The little debbie do not, in my opinion, taste as good as Hostess (my special favorite was the orange cup cake). I hope (insha’allah) Hostess will start using just vegetable products or make a Halal/Kosher line that caters to others, including vegetarians. I say vegetarians rather than vegans because vegans won’t even consume milk or eggs (if I’m wrong let me know). Peace to everyone and I can’t wait til fall gets here because I’m going to make pumpkin cookies. I have Muslims, Christians, and Jews in my family so we celebrate everyone’s holidays out of fairness and unified love =) I love my Family so much for this. I also found little Debbie to have the better tasting chocolate cupcake. I was hooked on them and would by the individual pack of two everyday but when they changed the packaging to the brown cupcake holders the taste became bland or seemed to aquire an aftertaste. Now I dont like either brand.